As the world looks at Mars, an American scientist has produced the best images ever obtained from the surface of a rather different planet - Venus. The second planet from the Sun is blanketed with a thick layer of cloud. Computer researcher Don Mitchell used original digital data from two Soviet Venera probes that landed in 1975. His reprocessed and recalibrated images provide a much clearer view of the Venusian surface which is hotter even than the inside of a household oven. 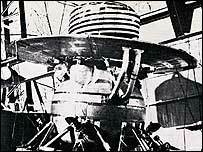 Between 1975 and 1981 Soviet probes landed on Venus 10 times. All the Venera craft survived the landing and four of them sent back images of the inhospitable surface, where the temperature is 490 deg Celsius and the pressure is 90 times that on Earth. The cameras that looked out on to this baking world were, for their time, remarkable pieces of technology. 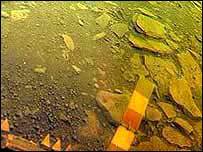 They were protected by high-pressure windows made of quartz one centimetre thick. 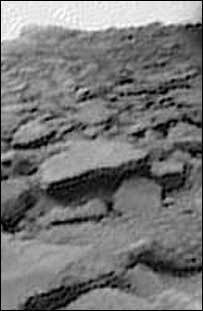 But they did obtain the first view of what was a rock-strewn surface with soil, slabs and boulders. For years, scientists have paid little attention to the pictures. Indeed, the images were usually only available as low-quality photographs in books. As part of a study of the Soviet exploration of Venus, Don Mitchell obtained the original digital data from the first probes that touched down, Veneras 9 and 10. "In a collection of old Russian data I found a file that contained the original 6-bit per pixel Venera 9 and 10 digital images," he told BBC News Online. He used up-to-date digital processing techniques on the raw data from those spacecraft, as well as from subsequent Veneras. "I took the raw data and carried out processes such as sharpening, recalibrating and compensating for blurring," he said. The results are a dramatic improvement on the images previously released from Veneras 9 and 10. Don Mitchell is now turning his attention to the data returned by subsequent Venera probes. He has started processing data from Venera 13, which are of twice the resolution of Veneras 9 and 10, and in colour. He believes they can also be improved. Reprocessed images copyright Don Mitchell.